In 2016, he starred as the title character in Deadpool. The film received critical and commercial acclaim and set numerous records at the time of its release for an R-rated comedy. For his performance, Reynolds received numerous accolades, including nominations for the Critics' Choice Movie Awards and the Golden Globe Awards. He reprised the role in Deadpool 2. Reynolds was named People's Sexiest Man Alive in 2010 and was awarded a star on the Hollywood Walk of Fame in 2017. He is married to actress Blake Lively, with whom he has two daughters. Ryan Reynolds was born on October 23, 1976, in Vancouver, British Columbia. His father, James Chester "Jim" Reynolds, was a food wholesaler, and his mother, Tamara Lee "Tammy" Reynolds (née Stewart), a retail salesperson. His paternal grandfather, Chester Ambrose "Ches" Reynolds, was a farmer and politician who represented Stettler in the Legislative Assembly of Alberta from 1940 to 1944. Reynolds is of Irish ancestry and was raised as a Roman Catholic. The youngest of four brothers, he graduated from Kitsilano Secondary School in Vancouver in 1994. He attended Kwantlen Polytechnic University, also in Vancouver, until dropping out. Two of his elder brothers work as police officers in British Columbia, one of whom is a Royal Canadian Mounted Police member. Reynolds' career began in 1991, when he starred as Billy Simpson in the Canadian-produced teen soap opera Hillside, distributed in the United States by Nickelodeon as Fifteen. Between 1993 and 1994, he had a recurring role in The Odyssey as Macro. In 1996, he had a supporting role as Jay "Boom" DeBoom in "Syzygy", the thirteenth episode of the third season of the X-Files, and co-starred with Melissa Joan Hart in the TV movie Sabrina the Teenage Witch. In 1996 Reynolds played Bobby Rupp, boyfriend of murdered teen Nancy Clutter, in a two-part miniseries In Cold Blood, an adaptation of Truman Capote's nonfiction novel of the same name. He also appeared in the anthology The Outer Limits episode "Origin of the Species" which originally aired on November 14, 1998. Beginning in 1998, Reynolds starred in Two Guys, A Girl and a Pizza Place, playing medical student Michael "Berg" Bergen, throughout the show's four season run. He starred in the National Lampoon movie Van Wilder in 2002 and appeared in The In-Laws, with Michael Douglas and Albert Brooks, and in the Canadian production Foolproof in 2003. Although he had performed primarily in comedies, Reynolds underwent intense physical training to play an action role as the character of Hannibal King in the 2004 film Blade: Trinity. The same year, he made a cameo appearance in Harold & Kumar Go to White Castle as a nurse. Reynolds played George Lutz in the 2005 remake of the 1979 horror film The Amityville Horror. Also, in 2005, he played a waiter named Monty in Waiting..., and appeared as music executive Chris Brander in the romantic comedy Just Friends alongside Amy Smart and Anna Faris. Additionally, he played an FBI agent alongside Ray Liotta in the 2006 crime action film Smokin' Aces. Reynolds played the protagonist in the 2008 film Definitely, Maybe. He also appeared in the second season finale of the television series Scrubs. In 2007, Reynolds guest-starred as Brendan's friend Hams in the episode "Douchebag in the City" of the TBS sitcom My Boys. Reynolds portrayed Wade Wilson / Weapon XI in a supporting role in the prequel X-Men film, X-Men Origins: Wolverine, which was released in 2009. He had previously spoken of his interest and involvement in a possible film adaptation of Deadpool with screenwriter David S. Goyer as far back as 2005. 2009 also saw Reynolds portray Andrew Paxton, opposite Sandra Bullock, in The Proposal, and Mike Connell in Adventureland. In 2010, Reynolds starred in the Spanish and American thriller Buried, which screened at the Sundance Film Festival. In June 2010, Reynolds was invited to join the Academy of Motion Picture Arts and Sciences. Reynolds portrayed the Hal Jordan version of superhero Green Lantern in Warner Bros.' film Green Lantern, which was released on June 17, 2011. The film did not fare well either financially or critically, but his role made him one of the few actors to headline films based on both Marvel and DC characters. In 2011, he co-starred in the comedy The Change-Up, as well as narrating the documentary film The Whale. In 2012, he portrayed an agent in Safe House, alongside Denzel Washington. He then had starring roles in two Dreamworks Animation feature films, The Croods and Turbo, both released in 2013. His next role was portraying Nick Walker in the Universal Pictures film adaptation of Dark Horse Comics' R.I.P.D. (Rest in Peace Department), which was released in 2013. Reynolds went on to star in low-budget films, The Voices and The Captive in 2014, as well as Mississippi Grind the following year. This was followed by a supporting role in the financially successful biographical film, Woman in Gold, before he returned to the thriller genre with Self/Less, also in 2015. In 2016, Reynolds found critical and commercial success with Deadpool, a film that had been in development as early as 2000. After portraying Wade Wilson / Weapon XI, without the name Deadpool, in X-Men Origins: Wolverine, he became heavily involved in the development of a Deadpool film. Deadpool featured a reboot of the character, ignoring the events of X-Men Origins: Wolverine, and establishing a new backstory for the character that was closer to the Marvel Comics source material. The film takes place within the larger X-Men film universe, being made possible by the reset timeline in X-Men: Days of Future Past. Deadpool made several box-office records, including: a worldwide opening of $264.9 million from 62 markets, which is the biggest of 2016, the biggest for an R-rated film, and the second biggest for Fox, only behind Star Wars: Episode III – Revenge of the Sith ($303.9 million). It also recorded the biggest IMAX 2D worldwide opening of all time with $27.4 million from 606 IMAX theatres, eclipsing The Dark Knight Rises ($23.8 million). The film's financial and critical success led the studio to move forward with a sequel. Also in 2016, Reynolds had a supporting role in the Ariel Vromen-directed thriller Criminal. On December 15, 2016, Reynolds received a star on the Hollywood Walk of Fame, at 6801 Hollywood Boulevard. Reynolds co-starred with Jake Gyllenhaal and Rebecca Ferguson in the science fiction thriller Life in 2017, which reunited him with Safe House director Daniel Espinosa. Reynolds began filming Deadpool 2 in June 2017, and the film opened on May 18, 2018. He will also star as the titular character in a live-action film adaptation of the Detective Pikachu video game in which Reynolds is the voice and facial motion capture actor for the CGI detective Pikachu. In January 2018, Reynolds signed a three-year first look deal with Fox, starting development on a live-action adaptation of the board game Clue, to be penned by Deadpool writers Rhett Reese and Paul Wernick. Additionally, in April 2019, Reynolds will shoot Free Guy, an action comedy directed by Shawn Levy in which Reynolds will star as “a background character who realizes he’s living in a video game. With the help of an avatar, he tries to prevent the makers of the game from shutting down his world.”  In 2020, he will return as the voice of Guy in the sequel to The Croods. In January 2019, Reynolds was named the face of Armani Code leading with a campaign for their Absolu scent. On April 8, 2019, it was announced that Reynolds will be the host of ABC's new game show, Don't which will premiere soon. In October 2008, Reynolds wrote for The Huffington Post regarding his plan to run the New York City Marathon for his father who, at the time, suffered from Parkinson's disease. 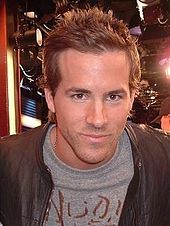 Reynolds appeared in People's Sexiest Man Alive lists in 2007 and 2009, and was awarded the top honour in 2010. On February 12, 2012, Reynolds appeared on the BBC's Top Gear as the Star in a Reasonably-Priced Car. He posted a time of 1:43.7. On May 13, 2018 broadcast of the South Korean reality television show King of Mask Singer, Reynolds had a special performance in the opening act, singing "Tomorrow". In 2002, Reynolds began dating Canadian singer Alanis Morissette. They announced their engagement in June 2004. In February 2007, representatives for Morissette and Reynolds announced they had mutually decided to end their engagement. Morissette said her album Flavors of Entanglement was created out of her grief after the break-up. The song "Torch" was written about Reynolds. Soon after the end of his relationship with Morissette in 2007, Reynolds began dating American actress Scarlett Johansson. The couple announced their engagement in May 2008, and married on September 27, 2008, in a private ceremony near Tofino, British Columbia. On December 14, 2010, Reynolds and Johansson announced that they had separated. Reynolds filed for divorce in Los Angeles on December 23, 2010; Johansson filed her response simultaneously. The divorce was finalized on July 1, 2011. Reynolds first met Blake Lively in early 2010 while filming Green Lantern, in which she co-starred. In October 2011, Hollyscoop reported they were dating. The couple married on September 9, 2012, at Boone Hall Plantation in Mount Pleasant, South Carolina. They have two daughters, born in December 2014 and September 2016. Reynolds has openly spoken about his lifelong struggle with anxiety, noting in 2018 that he carried out many interviews in the character of Deadpool to alleviate his fears. He became an American citizen circa 2018. Reynolds acquired a stake in Aviation American Gin in February 2018. He stated that his interest went beyond that of an owner, and that he planned to oversee the product's creative direction as well as taking an active role in the business. ^ "Ryan Reynolds Biography (1976–)". FilmReference.com. Retrieved May 27, 2016. ^ "Ryan Reynolds remembers late father with touching photo tribute". Entertainment Weekly. October 28, 2015. 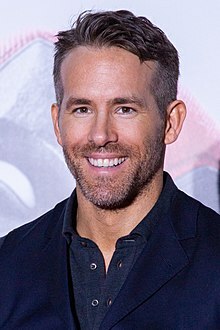 ^ "Ryan Reynolds' father dies at 74". USA Today. October 28, 2015. ^ "Weddings Reynolds – Stewart". Vancouver Sun. April 13, 1964. Retrieved December 22, 2018. ^ "Births & Deaths STEWART Peggy". Vancouver Sun. September 12, 2000. Retrieved December 22, 2018. ^ "Ryan Reynolds profile at FilmReference.com". filmreference.com. Retrieved April 28, 2010. ^ "Helen REYNOLDS Obituary". The Vancouver Sun. October 4, 2003. Retrieved August 6, 2018. ^ "Ryan Reynolds". Glamour. Retrieved January 16, 2012. ^ "Ryan Reynolds bio". Tribute Entertainment Media Group. Retrieved March 12, 2009. ^ "Ryan Reynolds Biography". Yahoo! Movies. Archived from the original on September 3, 2011. Retrieved May 18, 2018. ^ "About Ryan Reynolds". Canada.com. Archived from the original on May 10, 2008. Retrieved May 6, 2008. ^ "Ryan Reynolds almost copped it". The Sydney Morning Herald. smh.com.au. Retrieved October 1, 2010. ^ "A Look Back at Ryan Reynolds' Weird and Wonderful TV Career". film.com. Retrieved May 16, 2015. ^ "Ryan Reynolds". The New York Times. Retrieved May 16, 2015. ^ "Foolproof (2003)". Movie Gazette. Retrieved May 16, 2015. ^ "Ryan Reynolds talks 'Blade: Trinity'". movieweb.com. Retrieved May 16, 2015. ^ "Ryan Reynolds Goes for Scares with "The Amityville Horror"". About.com. Retrieved May 16, 2015. ^ "Smokin' Aces RYAN REYNOLDS INTERVIEW". movieweb.com. Retrieved May 16, 2015. ^ "Ryan Reynolds is stuck in the wrong movie in 'Definitely, Maybe'". New York Daily News. New York. June 3, 2008. Retrieved May 16, 2015. ^ "Ryan Reynolds Gets Deadpool Spin-off". TVGuide.com. Archived from the original on May 10, 2009. Retrieved May 6, 2009. ^ Stax (March 21, 2005). "The Latest on The Flash & Deadpool". IGN. Retrieved March 12, 2009. ^ "Sandra Bullock and Ryan Reynolds Discuss 'The Proposal'". about.com. Retrieved May 16, 2015. ^ "Ryan Reynolds Finds Himself Lost in 'Adventureland'". movieweb.com. Retrieved May 16, 2015. ^ "Sundance '10: Ryan Reynolds Speaks to Us from Inside a Coffin: 'Buried' Trailer Debut!". Bloody-disgusting.com. Retrieved March 6, 2010. ^ Kager, Dave (June 25, 2010). "Academy invites 135 new members". Entertainment Weekly. Archived from the original on February 3, 2012. Retrieved March 11, 2018. ^ Lowry, Brian (July 10, 2009). "BFDealmemo on Variety.com". Weblogs.variety.com. Archived from the original on July 13, 2009. Retrieved March 6, 2010. ^ "Safe House: Can Denzel Washington Ever Be a Bad Guy?". time.com. February 9, 2012. Retrieved May 16, 2015. ^ Holmes, Matt (March 28, 2011). "Producer Says X-Men 4 & 5 In Active Development, 'Deadpool' is 'Total Reboot'". Whatculture!. ^ Brevet, Brad (February 14, 2016). "'Deadpool' Smashes Box Office Records On Way to $260 Million Worldwide Opening". Box Office Mojo. Retrieved February 15, 2016. ^ "Worldwide Openings". Box Office Mojo. Retrieved February 15, 2016. ^ McClintock, Pamela (February 14, 2016). "'Deadpool': A Breakdown of Its Box-Office Records". The Hollywood Reporter. Retrieved February 15, 2016. ^ Brevet, Brad (February 15, 2016). "'Deadpool' Blows Away Competition with $150 Million, Four-Day Opening". Box Office Mojo. Retrieved February 16, 2016. ^ "Ryan Reynolds". Hollywood Walk of Fame. Retrieved December 18, 2016. ^ "Ryan Reynolds honored with star on Hollywood Walk of Fame". NewsTimes. Archived from the original on December 17, 2016. Retrieved December 18, 2016. ^ Fleming, Mike Jr. "'Deadpool's Ryan Reynolds To Star With Rebecca Ferguson In 'Life'". Deadline.com. ^ "The Complete Guide to 'Deadpool 2': Rhett Reese Says 'No Good Deed' Short Isn't a Trailer". Fuse. Retrieved March 7, 2017. ^ "'Deadpool 2' – release date, cast, trailers and everything you need to know – NME". NME. March 7, 2017. Retrieved March 7, 2017. ^ "Ryan Reynolds to Star in Pokemon Movie 'Detective Pikachu' (Exclusive)". The Hollywood Reporter. Retrieved December 7, 2017. ^ Kit, Borys (January 22, 2018). "Ryan Reynolds Signs First-Look Deal With Fox, 'Clue' Movie in Development". The Hollywood Reporter. Retrieved January 23, 2018. ^ Kroll, Kroll (September 19, 2017). "'Croods 2,' Revived as Animated Sequel, and Jason Blum's 'Spooky Jack' Get Release Dates". Variety.com. Retrieved January 20, 2019. ^ "THE NEW FACE OF ARMANI CODE ABSOLU: RYAN REYNOLDS". SWAGGER Magazine. March 11, 2019. Retrieved March 11, 2019. ^ "ABC Says Do to New Original Game Show, "Don't," From Banijay Studios North America and Executive Producer Ryan Reynolds". The Futon Critic. April 8, 2019. ^ Reynolds, Ryan (October 9, 2008). "Ryan Reynolds: Why I'm Running the New York City Marathon". HuffingtonPost.com, Inc. The Huffington Post. Retrieved March 12, 2009. ^ "The Sexiest Men Alive". People. November 14, 2007. Retrieved February 13, 2019. ^ "The Sexiest Men Alive 2009". People. November 18, 2009. Retrieved February 13, 2019. ^ "People Magazine Names Ryan Reynolds As Sexiest Man Alive". Archived from the original on November 20, 2010. ^ "Ryan Reynolds: "I'm a Horrible Driver" (TOP GEAR)". youtube. Retrieved May 16, 2015. ^ King of Mask Singer (in Korean and English). May 13, 2018. MBC. ^ James Dator (May 13, 2018). "Ryan Reynolds surprised a Korean TV singing show by performing 'Annie' dressed as a unicorn". SB Nation. Retrieved May 13, 2018. ^ Sam Stone (May 13, 2018). "Reynolds Dons Unicorn Costume, Sings Annie Soundtrack on Korean TV". Comic Book Resources. Retrieved May 13, 2018. ^ Silverman, Stephen M.; Midler, Caryn (June 16, 2004). "Alanis Morissette, Ryan Reynolds Engaged". People. Retrieved February 13, 2009. ^ Jordan, Julie (February 2, 2007). "Alanis Morissette, Ryan Reynolds End Engagement". People. Retrieved February 13, 2019. ^ "Alanis Morissette Talks Ryan Reynolds Breakup, Covering 'My Humps' — Access Hollywood". Access Hollywood. Retrieved March 6, 2010. ^ Messer, Lesley (April 9, 2007). "Mo & Ryan Reynolds Step Out in NYC". People Weekly. Retrieved February 13, 2019. ^ Chiu, Alexis (May 5, 2008). "Scarlett Johansson & Ryan Reynolds Engaged!". People. Retrieved February 13, 2019. ^ "Scarlett Johansson and Ryan Reynolds Wed in Canada". People. September 28, 2008. Retrieved February 13, 2019. ^ "Scarlett Johansson & Ryan Reynolds Split Up". People. Retrieved February 13, 2019. ^ "Ryan Reynolds, Scarlett Johansson's Divorce Finalized". UsMagazine.com. January 7, 2011. Retrieved October 6, 2013. ^ "Ryan Reynolds Files For Divorce From Scarlett". TMZ. Retrieved December 23, 2010. ^ "Ryan Reynolds, Scarlett Johansson's Divorce Finalized". Us Weekly. July 1, 2011. Retrieved July 1, 2011. ^ "Green Lantern Production Begins Today!". Screenrant.com. June 17, 2011. Retrieved May 28, 2013. ^ Vanderberg, Madison (October 12, 2011). "It's Confirmed: Ryan Reynolds and Blake Lively are Dating". Hollyscoop.com. Archived from the original on December 17, 2011. Retrieved January 28, 2012. ^ "Blake Lively & Ryan Reynolds are Married". People. September 9, 2012. Retrieved February 13, 2019. ^ Hines, Ree (March 20, 2015). "Ryan Reynolds reveals his baby's name on 'Today'". Today. Retrieved March 21, 2015. ^ Freydkin, Donna (February 2, 2015). "No, Blake and Ryan's daughter is NOT named Violet". USA Today. Retrieved February 21, 2015. ^ "Ryan Reynolds Confirms His Second Child With Blake Lively Is a Girl". E! News. November 3, 2016. Retrieved November 12, 2016. ^ Duboff, Josh. "Blake Lively and Ryan Reynolds Reveal the Name of their Second Daughter". Vanities. Retrieved June 24, 2017. ^ "This Story Has Already Stressed Ryan Reynolds Out". May 2, 2018. Retrieved May 18, 2018. ^ "Actor Ryan Reynolds buys a stake in Portland-made Aviation Gin". February 21, 2018. Retrieved May 22, 2018. ^ "Ryan Reynolds Takes a Sip of Aviation Gin, Decides To Buy The Brand". February 21, 2018. Retrieved May 22, 2018.